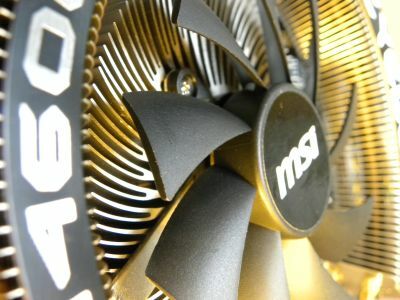 MSI’s N460GTX Cyclone 768D5 OC Edition is a factory-overclocked GeForce GTX 460. 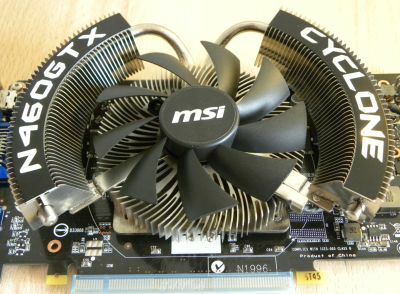 Only the GPU is overclocked and since GTX 460 are known to have nice overclocking capabilities, MSI’s product comes with a GPU clocked at 725MHz (+50MHz) which is far from the max clock as we’ll see it at the end of the test. 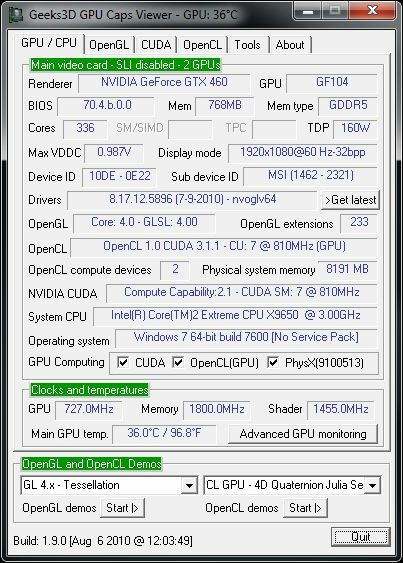 N460GTX Cylone is based on the GF104 GPU which support all latest technologies: OpenGL 4.x, DirectX 11 (I should write Direct3D 11…), OpenCL 1.x, PhysX and CUDA. 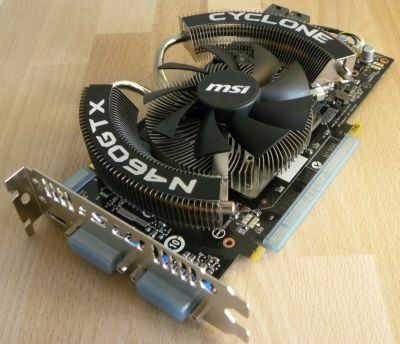 This card is equiped with a quiet VGA cooler with a 9cm fan and two heatpipes. I use this card for all my development needs since several days and this is a really nice product. This card is really quiet even under load and this point is important for me because my devstation is in an IKEA-based open case ( 😀 yes IKEA has some cool test benches, don’t you know it?)! Settings: 1920×1080 fullscreen, no AA, 60sec, Xtreme mode UNCHECKED. 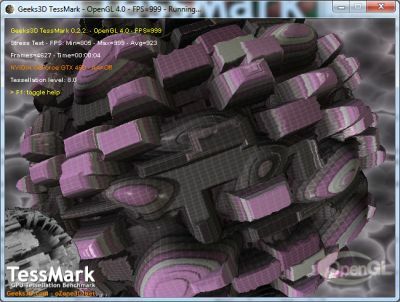 TessMark 0.2.2 has been used for the test. TessMark homepage is HERE. FluidMark 1.2.0 has been used for the test. FluidMark homepage is HERE. Settings: 1920×1080 fullscreen, no AA, 60sec, 3 emitters, 120000 particles, Async mode ON. Settings: 1920×1080 fullscreen, no AA, 60sec, Unlock power draw CHECKED. Ungine Heaven 2.1 has been used for the test. Settings: 1920×1080 fullscreen, tessellation: normal, shaders: high. 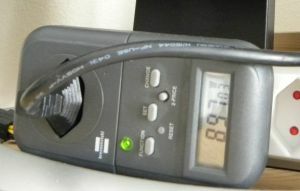 For measuring the power consumption, I use a simple wattmeter connected to the PSU input. (257-100) * 0.9 = 141W where 0.9 is an avg PSU factor (no too far from the reality with the Corsair AX1200). And 65°C is a very nice GPU temperature under heavy load. Using EVGA Precision, I increased GPU clock and each time I ran a FurMark session (1920×1080 fullscreen + Xtreme mode + Displacement mapping). 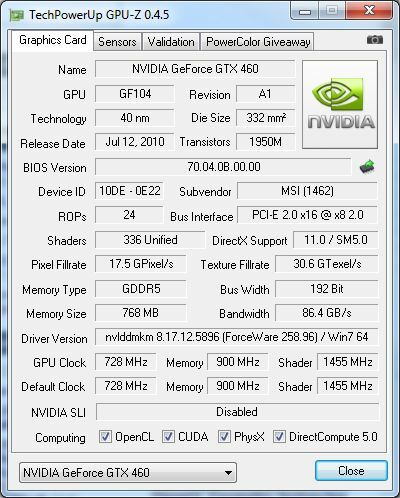 The GTX 460 ref gpu clock is 675MHz, the N460GTX Cyclone OC is 725MHz and you can push this card up to 850MHz. 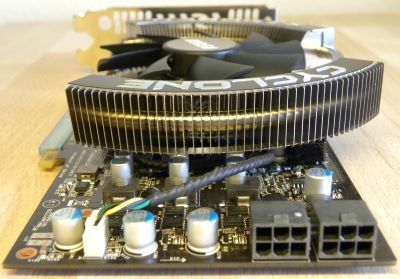 No doubt, the GF104 GPU is a gem for graphics card overclockers! 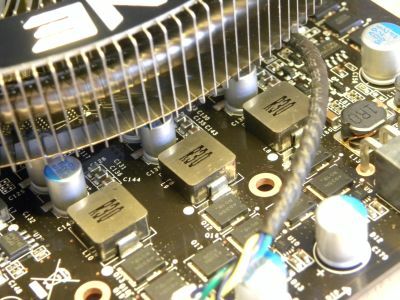 More than 850MHz lead to system freezes. you can push it to 900/1800/2300 with a little extra vGPU.. 1.09v (default is 1.00v).. 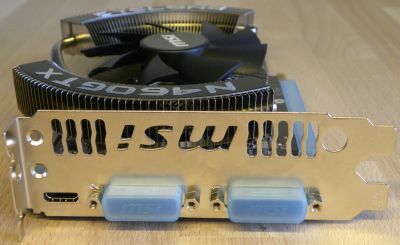 I am curious if this graphics card will run on a 450w PSU with an intel i5 quad (95 watt) and a Gigabyte intel P55 board. I don’t really plan to run much else on it besides one hard drive and two DVD-RW drives. If it fits within my power specs, it’s definitely a winner. 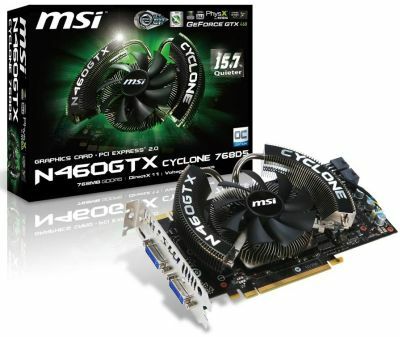 Could do a test with MSI N460GTX CYCLONE 1GD5/OC with 256-bit?